A common approach to comparing financial systems across countries is by looking at the role banks play in providing the real economy with credit. The Bank for International Settlements (BIS) has great data sets on measures of credit across countries that make it very easy to do such a comparison. 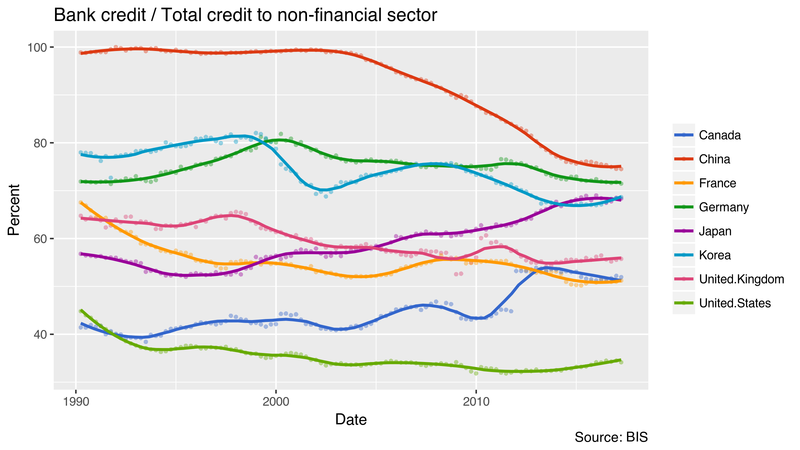 Plotting the share of bank credit relative to total credit across time reveals some interesting patterns. Generally, banks seem to play a much smaller role in the US than in Europe and Asia. More than 50% of US credit is not provided by banks but by other sectors of the economy and non-residents. The US is thus often seen as an example of a “capital market-based” financial system, whereas European and Asian economies are often seen as “bank-based” systems. The role of banks also appears to change with financial crises. Japanese banks' share declined up to the Japanese banking crisis in the late 1990s (link), after which it began rising again. Absolute figures tell us that this is mostly driven by the decline in total credit, which is most likely attributable to corporate deleveraging after the bursting of Japan's asset price bubble. Interestingly, the opposite seems to have happened in Korea, where banks' share has declined after the Asian Financial Crisis 1997-98 and the Global Financial Crisis 2007-08. Similarly, German banks peaked right around the time of the Dot-Com Bubble at the turn of the century.